Equine America Liver Flush Solution combines a unique selection of natural ingredients which support the vital functions performed by a healthy liver. 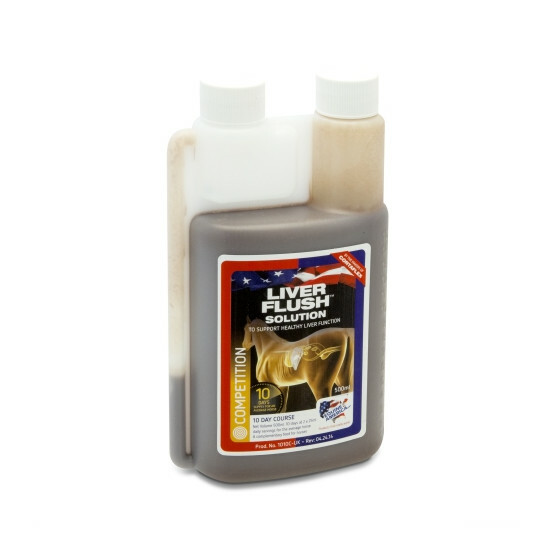 It helps to protect the liver cells and support the liver processes relating to digestion, metabolism, the storage of important nutrients, tissue regeneration and the reduction of toxins from the horse's body. Water, Silybum marianum, Taraxacumofficinale, Phyllanthus niruri, Cichoriumintybus v. sativum, Curcuma longa (Turmeric), Cochlospermum anglosensis, Chelidoniummajus, Mentha x piperita, Rumex crispus. Preservatives : Ammonium Propionate -E280 - 1,000mg/kg. Thickener : Xanthan Gum - E415 - 4,000mg/kg. Feed less for smaller horses & ponies and more for larger breeds. There are currently no questions for Equine America Liver Flush Solution for Horses - be the first to ask one!